February showed some signs of life for homes going under contract after surprisingly lackluster activity levels in January. But as we warned, trends take time to form, and so a good or bad month does not make a year. 2016 had been heralded by most to be a likely breakout year. Demand was expected to leap due to the continuing rise in rental rates, the boomerang buyers returning to the market (those who lost their homes and return to buy after credit recovery), Millennials beginning to buy, and the valleyâ€™s overall positive net migration. Despite the compelling reasons for a demand surge, the indicators so far have been underwhelming. Demand has remained in a pretty neutral range, neither retreating nor advancing significantly. The number of homes under contract is higher in 2016 than in the same time in 2015 by approximately 8%. That would be encouraging if that % was growing rather than eroding. Interestingly the purchasers are much more dominated by local buyers â€“ up by about 18%. Buyers with out of state addresses are running 8% less as they did in 2015. Anyone tracking the weakened Canadian dollar will understand why very few Canadians are buying these days â€“ down 64% compared to January 2015 (but they are wisely selling â€“ up 26% from a year ago). These increases give buyers a lot more choice. Scottsdale now has more active listings (including UCB) that at any time since 2011. Queen Creek stands out by having the smallest increase of less than 2%, unusually low for the time of year. The inventory in the 55+ active adult areas is growing significantly faster than usual. Sun Lakes has the highest number of active listings (including UCB) since early 2011. Cave Creek beats this by having the largest number of active listings since 2010. Despite these geographically supply shifts, we cannot overemphasize that price point is still a major factor in the supply/demand analysis. 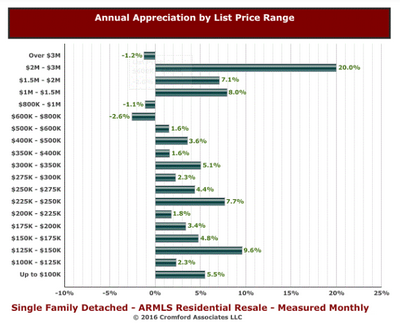 Below 200K, we still see very constrained inventory with multiple offers being the norm. Even with demand in neutral, it is outpacing and exceeding supply. We see no relief in sight at the moment. We will continue to watch 2016 and report the trends that affect our clients. As always, we are here to evaluate your particular neighborhood and provide a supply/demand analysis so you can make informed decisions.